Melamine is a durable, coated paper-based product applied to a composite core and can also be referred to as Thermally Fused Laminate (TFL). 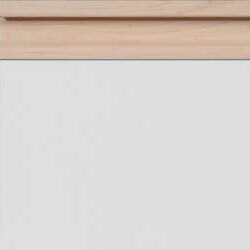 Melamine Doors and Drawer Fronts have a band around the edge to conceal and protect the composite core. Typically the core is made of MDF or Particleboard. The Composite Panels Association (CPA) describes TFL as made by fusing a resin-impregnated sheet of decor paper directly to a substrate. Heat and pressure activate the resin in the saturated TFL sheet, creating a cross-linked bond with the substrate. This effectively seals the substrate. Particleboard and MDF are ideal substrates for TFL because they are consistent, uniform in strength, and free of defects. The Composite Panels Association (CPA) is now using the new term Thermally Fused Laminate (TFL) for this product, replacing Thermally Fused Melamine (TFM).